DecisionSpace Production Engineering helps operators maximize production, increase recovery and improve efficiency through advanced production surveillance, forecasting and flow modeling for more complete asset understanding. The software also includes differentiated forecasting and modeling techniques for unconventional assets. Managers, petroleum engineers and geoscientists can pinpoint problem wells more quickly to deliver better production outcomes. DecisionSpace Production Insights combines production visualizations with interactive data analytics to provide instant asset awareness that informs and equips teams for better decision-making. With a collaborative asset view that integrates and aggregates key production and operational metrics, it enables comprehensive access to reservoir, well and financial information, as well as other enterprise data sources. 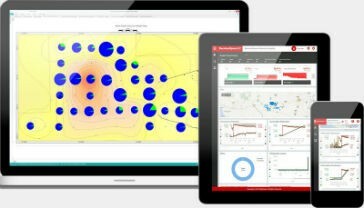 Operators can use the software via the Halliburton iEnergy® cloud, a collaborative platform for development and deployment. "Lowering the cost per BOE is the primary focus of every E&P company today," said Nagaraj Srinivasan, senior vice president of Landmark and Halliburton Digital Solutions. "Achieving this requires a transformative combination of engineering and economic understanding of production and the reservoir. DecisionSpace Production delivers a complete, open, modern and highly scalable solution to help operators achieve this goal."